These hot glue gun tips and tricks will have you hot gluing like a pro! 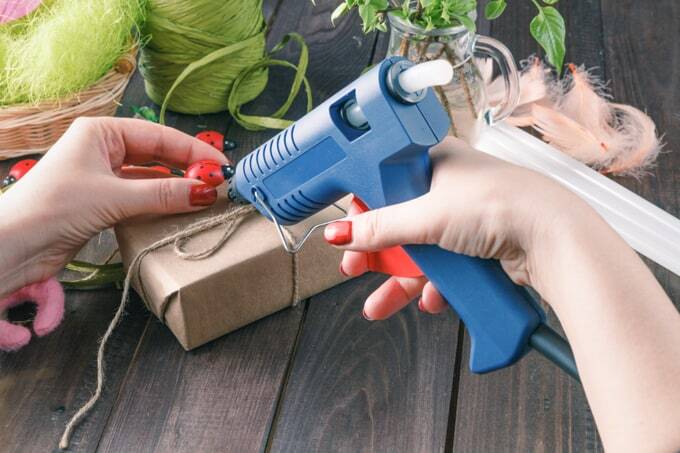 I’ve had several comments from folks recently who said they weren’t aware that there are different types of hot glue guns, so I decided to do a post with my top 10 hot glue gun tips and tricks! 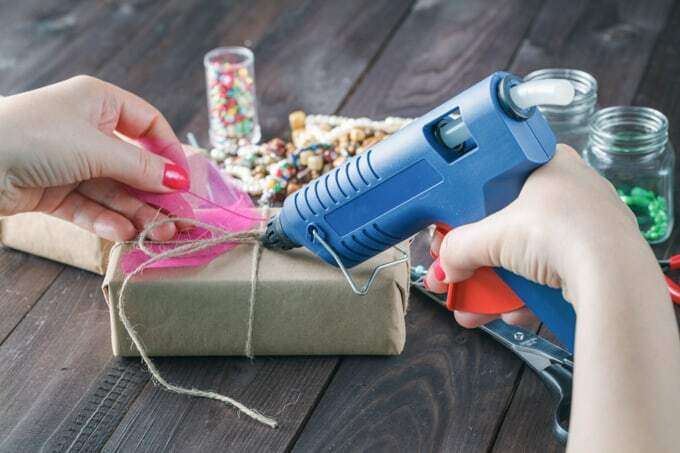 Hot glue guns are frequently seen as a crafter’s best friend, but sometimes they can feel like a worst enemy! If you’ve ever been left nursing a blister or burn from a glue gun, you know what I mean. 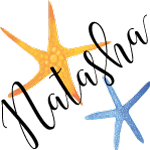 In this post I’ll be sharing tips for using a hot glue gun safely and effectively, advice on choosing the best glue for the job, and a bit about why I love using this non-toxic glue option. For a long time, I didn’t like hot glue. I wasn’t familiar with the various types of glue guns available and was frustrated with the low-temp hot glue guns I’d always encountered. Instead of hot glue, I used adhesives like E6000. E6000 is sometimes the right tool for the job, but, man, that stuff is toxic! Many other crafting cements are equally toxic, and I came to the realization that you just don’t need to expose yourself to those kinds of chemicals for your average crafting project! For me, using hot glue (and my other favorite, Original Tacky Glue) just makes sense. Why use lovely, natural materials and then stick them all together with a toxic chemical mess?! 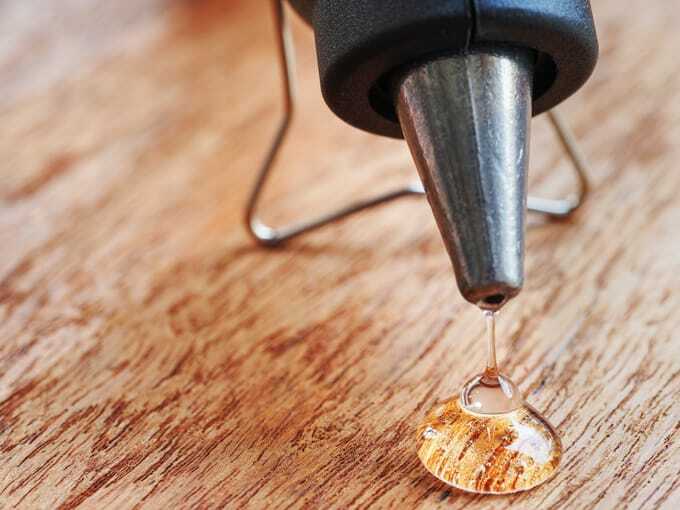 Hot glue is affordable, easy to find, and non-toxic, so it can be the perfect choice for many projects – if you choose the right type and use it safely. 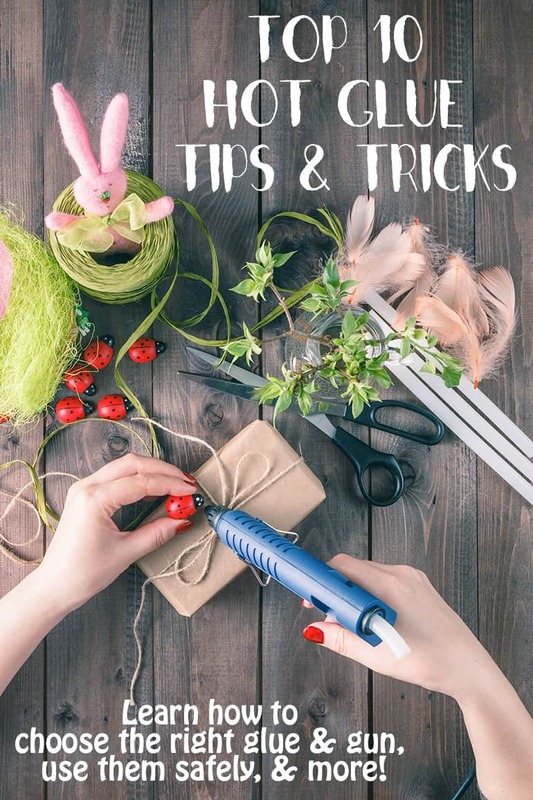 I hope you enjoy the hot glue gun tips and find them helpful! Low temp glue guns are best for delicate projects with materials that are more likely to be damaged or melted. They are better for materials like styrofoam, craft foam, and candy. They can also be the right choice for thin materials, like ribbon or foil, where the glue is more likely to seep through or transfer heat quickly while you’re working. High temp hot glue is more durable. Low temp hot glue can actually soften and come apart on hot days (I once watched a piece pop off a wreath on my wall and fall to the ground on a particularly hot day)! High temp hot glue is best for more durable materials and projects like wood, glass, metal, and floral pieces. Hot glue gun tip #2: Choose the best size glue gun for the job. This is an area where I’m guilty of not always following my own advice! I tend to use my mini guns for everything. However, it’s better to choose the best sized glue gun for the job. Small crafting projects are great for mini or mid-sized glue guns, but larger projects need a full sized glue gun. If, for example, you’re gluing fabric down to a large canvas panel, a full sized glue gun will help you get the job done much more quickly without wearing out your trigger finger! Hot glue gun tip #3: Get the right glue for your glue gun! There are multiple sizes of glue guns, including mini, medium, and full sized. There are also really big industrial glue guns! In general, you can choose between mini and full sized glue sticks; low, high, or dual temp sticks; and normal or speciality glue sticks. If you have a mini low temp glue gun, then make sure to get mini-sized sticks that are low or dual temp. Standard glue sticks will not fit in a mini gun and vice versa! Hot glue gun tip #4: When it doubt, test. If you don’t know which type of glue to use for a particular project, test and see! Test in an inconspicuous spot or on a scrap. For example, some types of more dense foam can handle high temp glue. If you’re not sure which glue to choose for your project, test. Hot glue gun tip #5: Protect your fingers. Hot glue mishaps will happen and they’re not comfortable! If you use a lot of hot glue, consider getting silicone finger protectors to keep your digits safe. Hot glue gun tip #6: Allow your glue gun to fully heat up. I know you want to get crafting right away, but let your glue gun heat up for 5-10 minutes before using it. If it feels like you have to force the glue in, the gun isn’t warm enough! Glue can start leaking out of the tip while the gun is heating, so position a scrap of parchment paper, a silicon mat, or a Teflon crafting sheet under your glue gun to catch any drips and wipe the tip off on a paper towel before using it. Hot glue gun tip #7: Use the glue gun at the correct distance. Basically you want your glue gun tip to be all up in whatever you’re gluing’s business. A lot of the time you can have the tip actually touching whatever you’re gluing. Using the glue gun in close minimizes mess and those annoying strings, plus it helps maximize your open time. Not sure what open time is? See the next tip! Hot glue gun tip #8: Be aware of your “open” time. Open time refers to the amount of time between when you apply the glue and when it forms a bond with the surface(s). The hotter the glue, the less open time you’ll have. This means with high temp glue guns you need to be ready to stick things in place immediately! With low temp glue guns, you sometimes have a little wiggle room time and can successfully reposition items if you work quickly. Working with your glue gun in close helps maximize open time because it minimizes application time and the glue’s exposure to air/opportunity to cool on the way out. 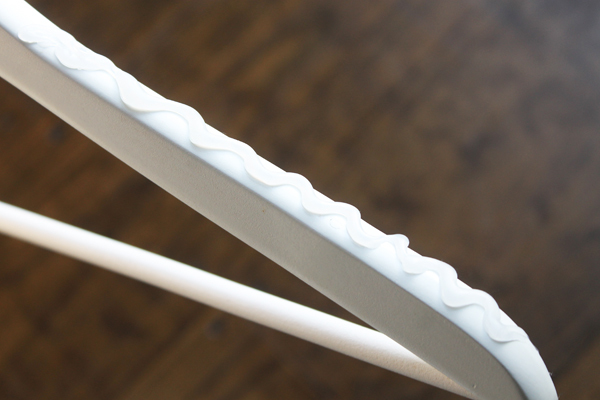 Hot glue gun tip #9: Prepare difficult to glue surfaces for better adhesion. mermaid hair pin tutorialIf you’re having a hard time getting the hot glue to adhere, trying wiping the surfaces down with rubbing alcohol (if that’s possible with the materials you’re using!). You can also scuff up surfaces for better adhesion, like I recommend in this . You can also make your own embellishments using silicone molds and hot glue! You can use these embellishments for jewelry, scrapbooking, mixed media art, and more. 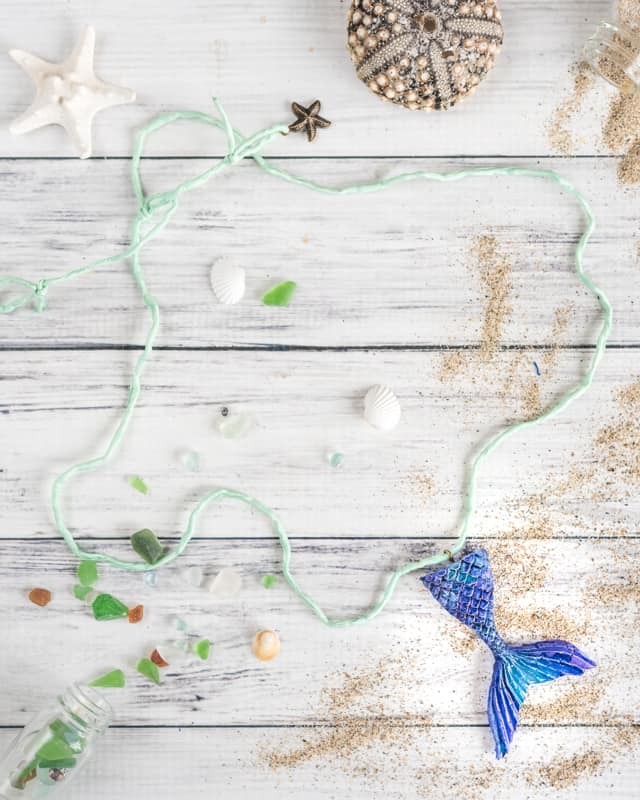 The molded hot glue is paintable, but you can also find how to make a mermaid tail necklace! Hot glue can be practical, too! Use hot glue to make your own non-slip clothes hangers, like in this post from The Shabby Creek Cottage, or make your own makeup brush cleaner board as shown in this video by YouTuber IamKayElle. Bonus tip! No matter what hot glue gun you’re using or what you’re crafting, keep your glue gun clean! All you need to do is plug your glue gun in, let it heat up a little, and then use some crinkled up aluminum foil to scrub off the gluey mess. Just make sure you don’t burn yourself! Do you have any favorite hot glue gun tips I didn’t mention? Any unusual ways you use hot glue to help out or create crafts? Thank you! I’m so glad you enjoyed the post and thank you for taking the time to let me know.